Before 1945, Laos had no provincial governors — only deputy-governors, because it was still a French colony. At the district chief level, some districts were under direct French control. After 1949, the year Laos regained its independence from France. Laos started seeing native Lao serving as provincial governors. In each of the 12 provinces that were created, the administrative structure consisted of one Chaokhoueng (governor), and several Chaomuang (district chiefs), Nai Kong (mini district chiefs), Tasseng (county chiefs), and Nai Ban (village chiefs). Each of those provinces was represented at the National Assembly by its elected “deputies”. MR-II, created in 1962, covered two provinces: Xieng Khouang and Houaphan. From 1893 to 1949, Laos was a French colony. On May 7, 1954 the French lost Dien-Bien-Phu, pulled out their armed forces from Indochina, and later granted independence to Laos, Cambodia and Vietnam. Despite being independent, those three countries became the theater of continuing interferences by Communist North-Vietnam. When the French were in control of Indochina, they did not pay much attention to the development of Laos, which was treated as a remote secondary territory, with roads and highways hard to build and maintain because of the high altitudes involved. Laos had no access to the ocean, blocked mostly as it is by high mountain ranges. The French picked Vientiane as a small trading center to relay merchandises to Thailand. They also picked Luang Prabang as the royal residence for the Lao king who served as advisor to the French on an as-needed basis. The French selected Seno as the main airbase in southern Laos. For northern Laos, they picked the Plain of Jars and Phongsaly. They divided Laos in two parts: Northern Laos and Southern Laos. They treated all three parts of Vietnam (Tonkin, Annam and Cochinchine) as an important business territory. Their main command center was Hanoi, North-Vietnam with Cap Saint Jacques, South-Vietnam was back-up. They had planned on making these two commercial centers look like Paris, but ran out of time. When Laos was granted independence by the French in 1954, the kingdom of Laos was subdivided into twelve provinces. In 1962, more provinces were added for a total of 18. Today, the Lao People’s Democratic Republic has 17 provinces, including Phongsaly, Luang Namtha, Bokeo, Oudomsay, Luang Prabang, Houaphanh, Xieng Khouang, Sayaboury, Vientiane, Vientiane City, Borikhamsay, Kham Mouane, Savannakhet, Saravane, Sekong, Champasak, and Attapeu. [The province of Sedone was reshaped by the Lao Communists). In 1945, the main Lao leader engaged in the fight to regain Laos’ independence from France was Tiao Phetsarath. Because of that fight, the French realigned their role of administrator of Laos to that of defender of Laos (against neighboring Thailand). On August 30, 1945, King Sisavangvong proclaimed Laos’ independence under French supervision. In September 1945, the Lao Issara Movement expressed its dissatisfaction with the proclamation made (with French support) by the king. Cabinet members not listed above included Tiao Somsanith and Leuam Insisiengmai). On January 27, 1946 Touby Lyfoung, Tougeu Lyfoung and Chao Saykham Southakakoumane (governor of Xieng Khouang) liberated Xieng Khouang from the Lao Issara and the Vietminh, who seized Xieng Khouang less than two months ago on December 28, 1945. On April 25, 1946 the French and their Lao rightist supporters regained Vientiane. The Lao Issara leaders from all over Laos opted to cross the Mekong River into Thailand. During one of those escapes, Tiao Souphanouvong got injured from the French air gun fire while crossing the Mekong River from Thakhek to Thailand. When he recovered from his injury, Tiao Souphanouvong fled into the jungle and eventually reported back to his commanding team, the Vietnamese Communist Party (which sent him to Thakhek in the first place in 1945). On August 27, 1946, the French signed an agreement granting independence to Laos with King Sisavangvong, who had been trying to bring all Lao ethnic groups under the same umbrella. The king was prepared to adopt a new constitution calling for the election of provincial representatives, and to oversee a Lao administrative system that relied on French support for national defense and economic development. At the same time, the kingdom of Thailand also reached an agreement with France on returning Sayaboury and Champasak provinces to Laos. On December 12, 1946, elections were held to select provincial representatives to work on the draft constitution. The final version of the Kingdom of Laos’ Constitution was adopted and publicly announced on May 27, 1947. In August 1947, national elections were held nationwide to elect representatives according to the new Constitution. King Sisavangvong named Prince Souvanna Phouma as Prime Minister for a one-year term. (TouLia Lyfoung was the first elected Hmong representative from Xieng Khouang). Their mission ended with the general elections of the National Assembly members on December 7, 1947 that led to the formation of a new government. In 1949, Kaysone Phomvihane announced the creation of the Lao Issara Movement while Ho Chi Minh formed the Indochina Communist Party in North-Vietnam. On July 19, 1949 granted independence to Laos within the confine of the French Union. On October 24, 1949 the Lao Issara Movement announced from abroad the dissolution of the “Lao Penh Lao” Party. 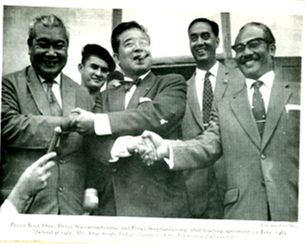 Some members of that party returned to Laos to join hands with the Royal Lao Government, and others opted to join Kaysone Phomvihane’s Lao Issara Movement supported by the Vietminh. On February 27, 1950 Phoui Sananikone was named Prime Minister of the third Lao Government. Its terms ended with the election of the new members of the National Assembly on November 2, 1951(Tougeu LYFOUNG was elected as congraessional of Xieng Khouang Province) most of whom supported Prince Souvanna Phouma. During August 13-15, 1950 the Lao Communist Party (LCP) led by Prince Souphanouvong, and Kaysone Phomvihane held their first party meeting. Souphanouvong was the president of the party and Kaysone Phomvihane was the Defense Minister for the LCP, which was under the Indochina Communist Party (ICP) headed by Ho Chi Minh. In 1951, Ho Chi Minh ordered big changes everywhere in the three Indochina countries (Laos, Cambodia and Vietnam). On November 21, 1951 Prince Souvanna Phouma formed the fourth Lao Government. The composition of this government was revised twice per Royal Decrees #13 dated May 8, 1953, and Decree #104 dated March 18, 1954. This government resigned to allow for the formation of a new government in accordance with the Accords signed by nine countries on July 20, 1954 in Geneva. After the signing of the Geneva Accords, the Lao Communist Party loudly proclaimed that the Indochina Communist Party had won a decisive battle. They then used military forces to attack the army of the Vientiane party, which they vilified as the servants of the French imperialists. On September 19, 1954 Kou Voravong, Minister of Defense of the Royal Lao Government and one of the Vientiane faction’s representatives at the signing of the Geneva Accords on July 20, 1954 was murdered while having dinner at Phoui Sananikone’s residence. On November 27, 1954 Katay Don Sasorith formed the fifth Lao Government. On December 1, 1954 Prime Minister Katay Done Sasorith called for a meeting of the two Lao factions to discuss national unification. His representative at the meeting was Dr. Thongdy, while the Lao Communist Party was represented by Phoumi Vongvichit. The meeting was first held in the Plain of Jars and failed to reach any agreement because the LCP acted too much like the winners. The second meeting was again held at the Plain of Jars, this time with Ounheuane Norasing as head of the Vientiane team, and Phoumi Vongvichit as head of the LCP team. The meeting still produced no results. The third meeting was held later in Vientiane, with Nhouy Abhay as head of the Vientiane team and Phoumi Vongvichit as head of the LCP team. Again, there was nothing positive to report from that meeting. The fourth meeting was also held in Vientiane, with Tane Chounlamountri acting as Vientiane team leader and Phoumi Vongvichit as LCP team leader. This fourth meeting was not any more successful than the previous three. Because of this lack of progress, Crown Prince Sisavang Vatthana proposed a meeting of the top leaders of the Lao two factions in Rangoon, Burma scheduled for January 6, 1955. The Vientiane team leader was Katay Done Sasorith and the LCP team leader was Prince Souphanouvong. This meeting in Burma led nowhere because the LCP stood by their original winner’s position. On January 21, 1955 the Katay Done Sasorith government ordered the Royal Lao Army to attack LCP military bases in Houaphan and Phongsaly Provinces and other bases. This motivated even stronger reaction from the LCP. On March 22, 1955 the LCP announced they have changed their name from Neo Lao Hak Xat to Khana Phathet Lao. On December 19, 1955 Laos became a member of the United Nations. On December 25, 1955, elections were held in the liberated zones of Laos. The 7th Lao Government resigned to pave the way for the formation of the Coalition Government on November 18, 1957. Their term ended after “Phak Kao Na” and “Phak Pathet Lao” joined together to form the “Lao Hom Lao” party following the new national elections, which the Neo Lao Hak Xat party participated in. Phoui Sananikone’s political party, which became the majority party in the National Assembly, cast their votes to terminate the Coalition Government on July 23, 1958. In early 1957, Capt. Kong Le was appointed lead officer for the training of the special, dare-devil units of the Royal Lao Army at the Chinaimo Camp. He used that opportunity to systematically go and chat with Tiao Souphanouvong at his Nam Pasak residence every evening. Tiao Souphanouvong referred to him as an individual with sharp teeth and nails, easy to curb, and very reliable. At that time, none of the Vientiane leaders paid any attention to Capt. Kong Le. On May 4, 1958 decision was made to elect additional national representatives. The Vientiane party and the Pathet Lao both announced the names of candidates for their respective party and were actively engaged in pre-election campaigns. June 10, 1958 was the vote casting day. Phagna Touby Lyfoung was one of those who got elected that day. On July 19, 1958 the International Control Commission (ICC) ended their control mission in Laos; members of the ICC then went back to their respective countries. On July 22, 1958 the government led by Prince Souvanna Phouma was dissolved as a result of the cut in all assistance programs by the US –who did not appreciate the presence of communist cabinet members in that Lao government. On August 18, 1958 Phoui Sananikone set up a new government without any Lao communist participation. By Royal Decree #206 dated August 18, 1958 the following cabinet members served duties from August 18 1958, to December 30, 1959. The second reshaping of the Phoui Sananikone’s government took place following a disagreement between members of the Committee for the Defense of the National Interests (“Comite pour la Defense des Interets Nationaux”, CDIN) and members of the Phoui Sananikone’s political party. The disagreement was related to the term extension of the third National Assembly members. Katay Don-Sasorith Vice-Prime Minister and Minister of the Interior, Religion & Justice. In December 1959, this government was dissolved because of its inability to control the political situation, and the emerging influence of the CDIN Committee that heavily attacked Phoui Sananikone. CDIN members, under the leadership of Gen. Sounthone Pathammavong, mounted a coup d’etat and asked Kou Abhay to form an interim government tasked with making preparations for the 4th national elections. Many noteworthy events also occurred. On May 7, 1959 the government ordered that the two Pathet Lao battalions stationed in Samneua and Xieng Khouang Provinces be combined with the rest of the Royal Lao Army. The Pathet Lao disagreed with the order, forcing Gen. Ouan Rattikoun to fly to the Plain of Jars and try to reach understanding with the Pathet Lao battalion there. But the general was stopped and asked at gun point not to meet with anybody. The general had to fly back to Vientiane and ordered the forces under his control to lay siege to the Pathet Lao battalion at the Plain of Jars led by Lt. Col. Tou Ya. On May 17, 1959 the two Pathet Lao battalions sent a fake promise to collaborate with the Vientiane faction within the next 24 hours. In the evening of May 18, 1959 heavy rainfall occurred and the following morning, the whole camp previously occupied by the Pathet Lao troops had been entirely vacated. Gen. Ouan Rattikoun ordered his Vientiane troops to chase the fleeing Pathet Lao in two directions, toward Paksane and toward Ban Bane, but to no avail. He then ordered Maj. Vang Pao to put Hmong troops in the pursuit. The leader of the pursuing team was Capt. Lee Pao. His unit caught up with the fleeing Pathet Lao near Muang Mork and engaged in a light fire arm exchange in which the commander of Pathet Lao Battalion 2, Tou Ya, got shot in the leg. Voices of crying teenagers and women were heard, prompting Capt. Lee Pao to contact Maj. Vang Pao for more orders. Maj. Vang Pao ordered Capt. Lee Pao to stop the attack and let the enemy walk away. On May 25, 1959 the Pathet Lao leaders were detained on order from the Phoui Sananikone’s government at the police camp of Phone Kheng because they had refused to combine their troops with the Royal Lao Army and, instead, let them escape. On August 4, 1959 the government declared an emergency situation throughout the country. On October 29, 1959 King Sisavang Vong passed away and Crown Prince Sisavang Vatthana was asked to take over the vacant royal seat. In late 1959, Capt. Kong Le was named commander of the second battalion of parachutists of the Royal Lao Army stationed at Wattai, Vientiane. The government was under Phoui Sananikone as Prime Minister. Laos was receiving some military training assistance from the US. In around December 1959, the Phoui Sananikone government was pressured by the Royal Lao Army to resign. On January 21, 1960 Kou Abhay formed an interim government to allow for new, nationwide elections open to all political parties. Their term of duties ended after the election of the 4th Congressional Representatives. On April 24, 1960 (the year of ChaoMouang Moua chiasang was assassinated) the election results showed that the newly elected representatives were exclusively from the Vientiane faction. The majority of the votes were casted for the CDIN party led by Tiao Somsanith, who then was automatically assigned the task of forming the next government. Royal Decree #151 dated April 6, 1960 gave the authority to Tiao Somsanith to form the government with cabinet members listed below. The term of duties was from April 5, 1960 to August 9, 1960. This government decided to appoint Souvanna Phouma as Lao Ambassador to France. On May 23, 1960 at midnight, all the Pathet Lao political prisoners detained at the camp of Phone Kheng very easily escaped, led by the main prison guard. This was the time when the Cabinet members were busy with the funeral of King Sisavang Vong in Louang Prabang and then were dismissed following the coup d’etat in Vientiane mounted by Capt. Kong Le, who then asked Prince Souvanna Phouma to form a new government. Capt. Kong Le mounted a coup d’etat and formed a neutralist government. On August 9, 1960 Capt. Kong Le mounted a coup d’etat against the Royal Lao Government led by Tiao Somsanith and Gen. Phoumi Nosavan. Capt. Kong Lae took that opportunity to bring in Pathet Lao troops and several battalions of communist North-Vietnamese to protect Vientiane, along with his own revolutionary troops. Tiao Souvanna Phouma Prime Minister and Minister of Foreign, Defense, Veteran. Prince Souvanna Phouma sent Gen. Amkha Soukhavong and Phagna Touby Lyfoung as his representatives to Xieng Khouang that ended up being detained by Maj. Vang Pao. On August 12, 1960 Kong Le sent a helicopter to Ban Na Nhang, near Muang Kasy to pick the five Lao communist leaders, who just escaped from jail, and have them serve as cabinet members in the new neutralist Souvanna Phouma’s government. The five Pathet leaders were Nouhak Phoumsavanh, Phoune Sipraseuth, Sisana Sisane, Singkapo Sikhot-Chounlamany and Phoumi Vongvichit. (Reference: Phoumi Vongvichit’s Memoirs, page 143). On August 15, 1960 Gen. Phoumi Nosavan announced the formation of a counter-coup d’etat government in Savannakhet to stand up against Kong Le’s revolutionary government in Vientiane. On August 16, 1960 Capt. Kong Le asked Prince Souvanna Phouma to form Laos’ third neutralist government. The counter-coup group did not participate in this government, which was later dissolved after Prince Boun-Oum Nachampasak mounted his coup d’etat. On September 10, 1960, Gen. Phoumi Nosavan and Prince Boun-Oum Nachampasak gathered more than half of the national representatives and opened a National Assembly session in Savannakhet that voted to dismiss Prince Souvanna Phouma’s government. On October 10, 1960 Gen. Kouprasith Abhay mounted an attack to liberate the city of Vientiane, but was not successful because of the strong defense put up by the communist troops. Prince Souvanna Phouma had to fly out to Phnom-Penh after relinquishing his prime ministership to Kinim Pholsena and Gen. Southone Pathammavong. In the military and other fronts, in early September 1960, the Souvanna Phouma’s government announced its cooperation with the Neo Lao Hat Xat and allowed the Pathet Lao to set their headquarters in Samneua, Houaphan Province. On October 13, 1960, Soviet Russia opened its embassy in Vientiane. On November 22, 1960 Prince Souvanna Phouma asked that Soviet Russia provide military and economic assistance to his neutralist government. On November 28, 1960 the counter-coup troops under the command of Gen. Phoumi Nosavan attacked the front line of Capt. Kong Le’s forces. During December 13-16, 1960 the Gen. Phoumi Nosavan’s troops attacked and liberated the city of Vientiane. A new government was then formed. [Phoumi Vongvichit in his Memoirs noted that, “We did not want to cause any damages to the population and the city of Vientiane and thus decided to move the battle field to the Plain of Jars”). This government was created per Royal Decree #283 dated December 14, 1960 and stayed in office from December 13, 1960 to April 23, 1962. It put the Kong Le’s revolutionary group to rest, but did not receive the needed votes of confidence from the members of the National Assembly until after the liberation of the city of Vientiane, as stated in Royal Decree #1 dated March 5, 1961. The cabinet members are listed below. This government was dissolved to allow for the formation of a tri-party government. Prime Minister Tiao Boun-Oum Nachampasak had to resign to make this happen. Once the counter-coup group liberated the city of Vientiane, troops under Capt. Kong Le’s command retreated from Vientiane along highway 13 heading toward Phone Hong, Vang Vieng, Kasy, Sala Phoukhoune, and the Plain of Jars. When they reached Muang Soui on December 25, 1960 they received food supplies and military equipments dropped from Russian airplanes between Kasy and Muang Soui. Once Kong Le has regrouped his troops, he started attacking the rightist forces at Ban Bane, Muang Kham and the Plain of Jars, using military support from the North-Vietnamese communists. On December 30, 1960 Maj. Vang Pao, commander of the rightist troops protecting the Plain of Jars, received some air reinforcements from Gen. Phoumi Nosavan but did not have the time to use them. On December 31, 1960 the Kong Le’s troops, combined with North-Vietnamese communists, easily seized the Plain of Jars and Xieng Khouang. 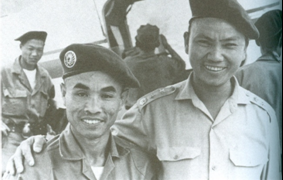 On February 11, 1961 Prince Souvanna Phouma flew back to Laos and landed in Khang Khay, Xieng Khouang Province, to join hands with the Lao communists and North-Vietnamese communists who had just captured and were in full control of the Plain of Jars. The capture of the province of Xieng Khouang by the Kong Le’s troops led to dangerous changes. The people in those two provinces parted ways and/or became enemies as a result of the fight between the three Lao factions –leftists, neutralists and rightists. In the end, the leftists were fighting the neutralists, bringing in Vietnamese communists to slaughter the Lao people. Furthermore, the whole country was also divided into three territories answering separately to the rightists, the leftists, or the neutralists. The Lao people lost all their freedom because of mutual mistrust and total lack of confidence as a result of the Vietnamese communists’ incitement. On February 24, 1961 Prince Souvanna Phouma flew back to Cambodia as he felt that the situation was not safe yet for him to stay in Laos, due to the ongoing fighting in all corners of Xieng Khouang and Houaphan Provinces between the rightists, the neutralists, the Pathet Lao and the Vietnamese communists. On May 8, 1961 the International Control Commission (ICC) consisting of representatives of India, Canada and Poland came back to resume its duties in Laos. On May 11, 1961, the ICC announced the cease-fire. On May 16, 1961 a negotiation meeting was held in Geneva, Switzerland. On June 22, 1961 the three Lao princes –neutralist Souvanna Phouma, rightist Boun-Oum Nachampasak and leftist Souphanouvong– met in Zurich, Switzerland. They continued their discussions on the formation of a three-faction Lao government until June 12, 1962 at several meeting sites including Hine Heup, Plain of Jars and Zurich. When they failed to reach any agreement, North-Vietnamese and Pathet Lao troops strongly attacked Luang Namtha Province. In May 1962, the US sent their military forces to Thailand to control the communist expansion into southeast-Asia. On June 23, 1962 the second Lao coalition government was formed. On July 23, 1962 representatives of the three Lao factions met in Geneva, Switzerland to support Laos’ neutrality. At that meeting, Boun-Oum Nachampasak, Souvanna Phouma and Souphanouvong were represented by Phoui Sananikone, Kinim Pholsena, and Phoumi Vongvichit respectively. One of the agreements reached was to have all the foreign troops leave Laos completely. That agreement did not prevent the Vietnamese communists to beef up their troops in Laos. The Lao Coalition Government was reshaped five times per Royal Decree #219 dated March 23, 1962 due to the peace agreements reached in Geneva. The cabinet members served their duties from March 23, 1962 to June 1974. In November 1962, following an internal disagreement between neutralist Capt. Kong Le and neutralist Deuan Sounarath, the neutralist forces stationed at the Plain of Jars split into two neutralist groups. [In his book on the Phuan history, Chao Khamlouang Nokham wrote on page 232, “Gen. Kong Le started noticing the feet of the snake and the snake then started eating the feet of the hen”]. Tiao Souphanouvong picked Col. Deuan Sounarath to replace Kong Le. As a result, the neutralist troops fell into pieces. Photo #91. The three Lao princes (from left to right: Chao Boun-Om Nachampasak, Taio Souvanna Phouma and Tiao Souphanouvong .In 1962, the three princes divided Laos into three parties –rightist, neutralist, and leftist—that fought against each other. In the end, Laos fell to North-Vietnam and the Lao monarchy came to an end in 1975. During 1962-1963, Gen. Vang Pao’s command center located at Padong (LS05) was heavily attacked by the Vietnamese communists. In 1963, Pathet Lao troops combined with North-Vietnamse troops attacked the neutralist troops of Kong Le and pushed them out of the Plain of Jars toward Muang Phann. On February 12, 1963 Col. Ketsana Vongsouvan, Kong Le’s chief of staff, was murdered at the Plain of Jars. Photo# 92. 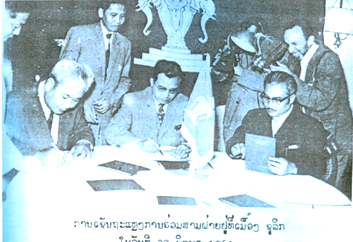 The three Lao princes signed an agreement on June 22, 1961. From left to right: Chao Boun-Oum, Phoumi Vongvichit, Tiao Souvanna Phouma, and Tiao Souphanouvong. Photo #93. Capt. 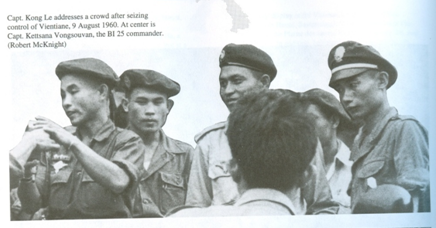 Kong Lae, Col. Kettsana Vongsouvan (the 3rd person to the left of Kong Le and his right hand man who was assassinated in the Plain of Jars in 1964 by Col. Thao Deuane Sounnarath and the Communist Pathet Lao) and Col. Deuane (the last person to the right). On April 1, 1964 (Buddhist Year 2507) Kinim Pholsena, Minister of Foreign Affairs and the neutralist signer of the 1962 Geneva agreement on behalf of Prince Souvanna Phouma, was murdered on April 1, 1964 (Buddhist year 2507) by his personal guard, Sergeant Saykong, as he was coming home in the That Dam neighborhood from a dinner party. He was replaced as Minister of Foreign Affairs by Khamsouk Keola. On April 12, 1964 Police Chief Khanthi Siphanthong, a pro-leftist neutralist, was murdered at his home in the Saylom neighborhood, Vientiane. This assassination lifted the neutralist issues one notch further. In 1965, the Kong Le’s troops retreated from Muang Phann to Muang Soui, Xieng Khouang Province. In 1967, they then moved from Muang Soui to Kasy, Vientiane Province. Later on, having nowhere else to go, Kong Le chose to go abroad, leaving his neutralist troops all scattered around, some in Vang Vieng, and some in the city of Vientiane. Soon afterwards, Kong Le’s neutralist troops literally disappeared from the scene. The assassination of Kinim Pholsena caused the split within the coalition government, and compelled all the Pathet Lao leaders to go back to Samneua. As a result, Prince Souvanna Phouma had to reshape his government for a total of five times. Ngone Sananikone took over Tiao Souphanouvong’s position of vice-Prime Minister. Tiao Sisouk Nachampasak took over Phouangphet Phanareth’s position of Minister of Finances. On April 19, 1964 Gen. Kouprasith Abhay and Gen. Siho Lanphouthakun mounted a military coup against Prince Souvanna Phouma’s interim coalition government and demanded that this government put a higher priority on resolving the country’s economic and social problems. Their coup d’état was not very productive because foreign countries stood by Laos’ neutrality status and, instead, exerted a lot of pressure on the coup d’etat instigators to return the power back to Tiao Souvanna Phouma’s government. Power was indeed restored to Prince Souvanna Phouma so that he could resume his Prime Minister function and put his government back in action on April 23, 1964. In early June 1964, the Vientiane government ordered heavy air bombardment by T-28 aircrafts on Pathet Lao and North-Vietnam’s military command centers in the Plain of Jars area. In September 1964, the three Lao factions opened another series of negotiation meetings in Paris without much success. On February 5, 1965 Gen. Kouprasith Abhay and rightist high-ranking military officers mounted a coup d’état to chase deputy-Prime Minister Phoumi Nosavan, National Coordination Department Director Gen. Siho Lanphouthakun, and Lao Air Forces commander Gen. Thao Ma to Thailand. After reaching Thailand, these three individuals sought and got political refugee status from the Thai government. On April 17, 1966, Gen. Siho met with a priest in Thailand to ask him for protective amulets and then surrended himself to the Laos authorities in Pakse. He was then sent for detention at the Phou Khao Khouay prison where he was later killed while attempting to evade on September 4, 1966. Nobody paid any attention to his death. Souvanna Phouma took over the position of Minister of Foreign Affairs from Pheng Phongsavanh. Souvanna Phouma added the position of Minister of Rural Development to his current positions. In October 1973, Gen. Thao Ma went to Wattai and used one of the T-28 aircrafts at the airport to drop bombs on the Chinaimo and Phone Kheng military camps for revenge. Gen. Kouprasith was able to escape the bombing at the last minute. After dropping bombs, Gen. Thao Ma flew back to the Wattai Airport to reload more bombs on the aircraft. As his plane hit the air strip, its landing gear got stuck, forcing the pilot to use emergency landing procedures that failed. Gen. Thao Ma was seriously injured, captured and carried to the headquarters of Gen. Kouprasith, who then killed him in front of several witnesses. 1966 was the year Lyteck Ly Nhia Vue got his law degree from a French university. As Gen. Vang Pao needed a staff member with good education to help him, he invited Lyteck to come and work as ethnic group administration and legal affairs. Lyteck, however, chose to go back and work at the Ministry of the Interior in Vientiane. He either did not feel comfortable working with the ethnic minorities and the military, or maybe he had a different career plan. In the end, in 1975, Lyteck was arrested and put in detention in Vieng Xay, Houaphan Province, where he was killed not long afterward. When they were working in Vientiane, Lyteck and Yang Dao ran into several problems. Both were well-educated but lacked cooperation and understanding skills. 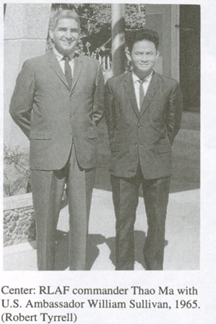 Lyteck had worked longer as a civil servant than Yang Dao, as Gen. Vang Pao picked Yang Dao who just completed his university level education to be a member of the three-faction Joint Political Committee in 1973.